Flamenco began in 15th century Spain. It is a unique art form – a cultural celebration that mirrors the life of the people. 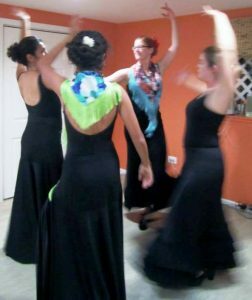 Everyone can make a personal connection with Flamenco whether it is through music, singing, or dance. This pure and simple expression is what gives Flamenco its basic attraction. Its sights, sounds and rhythms deliver an almost immediate invitation to the listener and viewer – Flamenco has a genuine magnetic quality. Flamenco has deep roots with the Romani. The Romani are often referred to as “gypsy” but not all gypsies are Romani. They are an ethnic group primarily living in Europe, with roots tracing back to the warrior class of Northern India, in the Punjab region. While Flamenco has its origins with the Romani, it has been influenced by diverse ethnic groups contributing to its continuing development and evolution. These groups include the Spanish, Byzantine, Sephardic, and Moorish cultures. Because it is an art form of the people, its primary vessel of documentation is that of oral tradition. For centuries, generation upon generation has passed on this rich cultural art form, one that has spread worldwide and will continue to appeal to future generations.